Mommy, should the police get killed too? No my son, no baby. No, too much killing already. We fight the killing ok? Remember the protest we went to? But they keep killing and killing and killing . . . His voice sing songs, chanting the words over and over. Shhh, I promise, we’re gonna stop this. Promise, okay? Now, it’s time for you to go school. I hug his seven-year old body hard. His thin legs wrap around my waist. His head rests in the curve of my neck, the curly hair tickles my skin. I take a deep breath of him, cocoa butter scent and all, and I exhale my love out, willing it to every cell of his body. This is my son, seven years old wise and growing so fast. I promise, I promise. Hey, I say, without the usual light and honey in it, what does your name mean? He goes along, face pressed into my neck so his voice is muffled. Rare and precious. Because? Because that’s what Mommy said the first time she saw me. We murmur it together holding each other in our special love hug, tight as we can. We get here after his outraged father is online looking at the latest video. I shoo my son into the other bedroom to dress before he can make his quick dash to the computer and peer over his father’s shoulder, volume turned down lower than we’d like, so we strain to hear while watching the gray video. Oklahoma this time, a black man stopped on a highway, confronted by police and suddenly, the worst we can too easily imagine happens. He’s on the ground, shot, dying, dead. I press play on another, gray video, this time of the police chopper above, and a voice inside bearing witnessing, commentating while it all happens on the ground. He’s complying . . . That looks like a bad dude. Our son creeps back in the room, leaps on the bed, trying for a glimpse of the screen transfixing his parents. My arm reaches out automatically, catches him and leads him some feet away. I clench my jaw shut. Looks like a bad dude. From the sky even, no ID, no bio, no system check, no nothing, black and dangerous, from the sky. 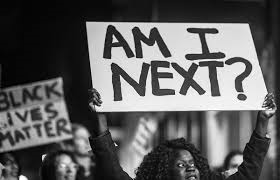 And Terence Crutcher is alone on the ground in Tulsa bleeding out, nobody relentlessly trying to save him, placing pressure on his wounds, rendering CPR, only police scrambling, calling more police, and the cop voice in the chopper, matter of fact shot calling the same. My son has to get to school. I busy my head mentally checking off the usual morning getting ready to go to school tasks. Teeth brushed, check, lunch done, check, hair brushed check. But my son is checking his father shaking his head, pressing play on a muted screen over and over while muttering to himself intermittently. He’s checking my quiet too, the missing last fussing over his clothes or his mismatched socks. He knows these cues. His questions are relentless. Did somebody get killed? Who got killed? By police? By another bad guy? Who died Mommy? Don’t worry about it, I tell him. Time for you to go to school. Get your shoes on, I tell him. Daddy’s ready to take you now I add as if he can’t see his father, still sitting there, same posture, shaking his head at gray video, oblivious to our tussle feet away. It shocks me out of autopilot. No baby, no. Is killing good? No, I hate killing. Why won’t the police stop? They could just take them to jail right Mommy, not killing them? September 20, 2016. I’m writing, again, because my son leaves for school still in conversation with me, spilling his thoughts aloud as I hurry him out the door to his father waiting in the car. Some of my classmates are white, they won't get shot, but my friend M he’s black. I'm worried he might grow up and the police might shoot him or some other bad guys . . . They might at shoot me . . . We need to fight for freedom . . . They just keep killing and killing and killing. Sing song chanting down the short driveway to the car. My voice calls to his back. Yes, baby, I promise, okay, I promise. I love you all over. It drops to just above a whisper he cannot hear. Be good at school. I promise. A promise I don’t know how to keep. A promise I must keep.